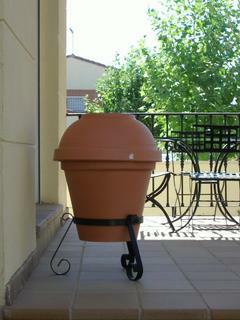 SAL DeTRAGLIA'S VIRTUAL TAPAS BAR: COMING NEXT WEEKEND...SAL'S "GREAT FLOWER-POT BBQ SMOKER EXPERIMENT." COMING NEXT WEEKEND...SAL'S "GREAT FLOWER-POT BBQ SMOKER EXPERIMENT." Btw - thanks for making me hungry and I think that my German employer would like to talk to you as I have just spend at least 30 minutes of my working day catching up on your magnificent blog! You mention watching American Chopper on the Discovery Channel - did you by any chance see the add where Lance Armstrong finds the entire mad Teutuls family in his bedroom......."refreshing" his bicycle with some chopper features? Sure is great. I see that you're back from your holiday in the Arctic Circle. I understand that Vladivostok is quite pleasant this time of year. Your technologically-adept mind has once again identified a golden opportuntity. A webcam-broadcast of the "Great Flower Pot Smoker Experiement" is a brilliant idea...except for two problems: (a) I don't own a web-cam; and (b) I'd assume that nobody wants to sit in front of a PC for ten hours watching a smoking flower pot. However...you are encouraged to hop on an SAS flight to Spain and share the fruits of this incredibly time-wasting exercise in culinary eccentricity. And don't worry. If the experiment fails, we'll do a stir-fry. As for American Chopper...I love that show, although I didn't think it had such a following in Denmark. Perhaps the Teutul family also make chopper-ized versions of snowmobiles. I didn't see the Lance Armstrong episode, but must keep my eyes open for it. It sounds like a gut-buster. And hey! If my weekend experiment is a success, maybe we can fabricate an American Chopper Smoker on which to BBQ a Burmese Python. Promising? I hope so. If this works, we must tell ChicagoKarl. And yes, it was cheap. All the components (which I'll detail in a post this weekend) cost 75€ -- 18€ of which was that highly-unnecessary (but oh so attractive) wrought-iron tripod. Yes...I think this contraption WILL work, provided that the German-built 1500Watt hotplate can withstand ten hours of continuous operation. And oh yeah...provided also that it doesn't rain. Think positive thoughts. A man without Q is like a Martini without an olive. If my test-run is successful, I'll have the entire EU over of lunch some day. Best of luck with your creation! Your ingenuity so impressed me that I mentioned it in my blog, so that my other two readers would visit your site. :) I also compared you to Don Quijote... it just seemed appropriate! Thanks Angie. I just hope that our local Fire Department (which, I'm certain, has never heard of a BBQ smoker...let alone seen one) view my experiment with the same good humor when they start receiving calls from my neighbors. And you are correct to compare me with Don Quixote. We have, more or less, the same build. Weberish indeed, cousin CuFo. But this contraption didn't cost me 150€ in shipping fees. And if this experiment fails, then at least I can use to components for next year's crop of basil (i.e., another experiment that's destined to fail). This looks like fun. I could see it with some explosives too. Why just cook? That little comment will probably earn you a visit from the FBI this afternoon. Good luck on the experiment Sal, it certainly looks promising. Of course now you may need to locate a source of hickory or mesquite smoking chips, or charcoal (carbon vegital at the local carboneria used to be easily available and cheap). Electrical resistance heating for a smoker is a felony in most parts of the South, but I believe it might be forgiven due to your locationbeing well outside BBQ country. You are the brainchild behind this terra cotta smoker, ya know. Since I am beyond the reach of Sheriff Buford T. Pusser, I do intend to use an electric hotplate as my heat source. As for wood...hickory and mesquite are hard to come by here. So, I'm using cepas (grape vine clippings). If it's good enough for paella, then it ought to be good enough for the 1-7kg brisket that's sitting in my fridge. Full report to come Sunday or Monday. Thanks again for pointing me in the right direction. Cathy tells me that meat cooked on cepa/sarmiento brasas is very good, never tried it myself to my knowledge. When I lived over there we often cooked steaks or ribs a las brasas using neatural charcoal in an old wash tub with a refigerator rack, which all of our Spanish neighbors thought was novel...as they had only seen people cook like that in their pueblos. My now brother in law in ZZA has a gas grill purchaced at Alcampo or Corte Ingles, but propane (no matter what Hank Hill says about it's virtues) just does not impart the flabor that wood does. Hell- if the terra cotta smoker takes off, you'll have to make the necesary modifications to the store bought pots (handles, smoke stack, etc) and market them- there certainly is no shortage of TC pottery factories in Spain to make them for you.